What is causing these accidents? Both collisions near Japan, in May and now in June. Both involving huge US Naval warships. On June 16 the Fitzgerald was bashed by the container ship at 2:30 am, middle of the night. On May 9 the Lake Champlain Ticonderoga was also struck by the fishing boat, but this happened in the afternoon. [and from another] https://www.washingtonpost.com/world/us-navy-destroyer-collides-with-container-ship-near-japan-suffers-damage/2017/06/16/111df46e-52e7-11e7-b74e-0d2785d3083d_story.html The Fitzgerald, which is more than 500 feet long, collided with a fully laden, Philippine-flagged container ship, the ACX Crystal, about 2:30 a.m. local time, about 12 miles from the Izu Peninsula and 56 nautical miles southwest of Yokosuka. Helicopter footage showed the container ship with minor damage to its bow, while the Fitzgerald appeared to have significant damage above and below the waterline. Also unclear was how the two massive vessels collided. There are extensive international guidelines for accident avoidance at sea known as the International Regulations for Preventing Collisions at Sea, or Colregs. The rules require that ships must have a watch posted at all times and follow a number of collision-avoidance steps when crossing paths with or overtaking other vessels. 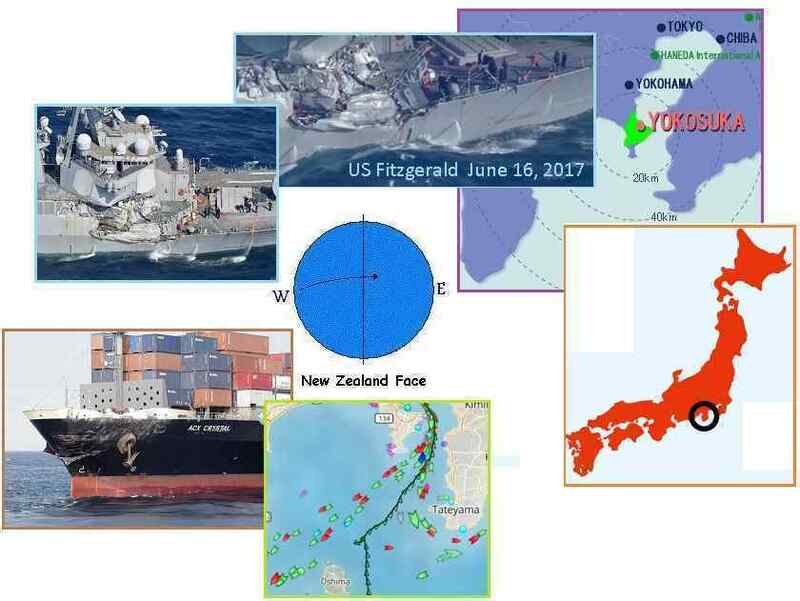 [and from another] https://www.rt.com/usa/392625-uss-fitzgerald-navy-crash-japanese-ship/ [and from another] https://www.rt.com/news/387711-us-warship-collides-south-korea/ 9 May, 2017. The USS Lake Champlain Ticonderoga-class cruiser has collided with a South Korean fishing vessel during drills in the Sea of Japan. The vessels crashed during a training mission in Japanese waters, 70 miles (112km) east of Gyeongbuk Province. No casualties have been reported so far. The cause of the accident remains unclear and is to be investigated. The boat suddenly appeared near the warship, which at the time was involved in drills along with another vessel. [and from another] http://www.cnn.com/2017/05/09/politics/fishing-vessel-hits-us-navy-ship-south-korea/index.html A US guided-missile cruiser was struck by a South Korean fishing boat. The fishing vessel crew later said it didn't have a radio and didn't hear the radio calls from the Navy.